The USAF’s first swept-wing jet aircraft and first production aircraft to break the sound barrier (Mach 1). The F-86 first flown October 1,1947 and set a world speed record in 1948. Originally designed as a high altitude day fighter, it was redesigned into an all-weather interceptor and fighter- bomber. With a total of 9,860 of all variant models produced. The F-86F had an upgraded engine and larger “6-3” wing without leading edge slats. The F-86 first saw combat in the Korean War where it engaged Russian MIG-15 fighter jets. By the end of hostilities, it had shot down 792 MIGS losing only 76 Sabre jets, a victory ratio of 10 to 1. 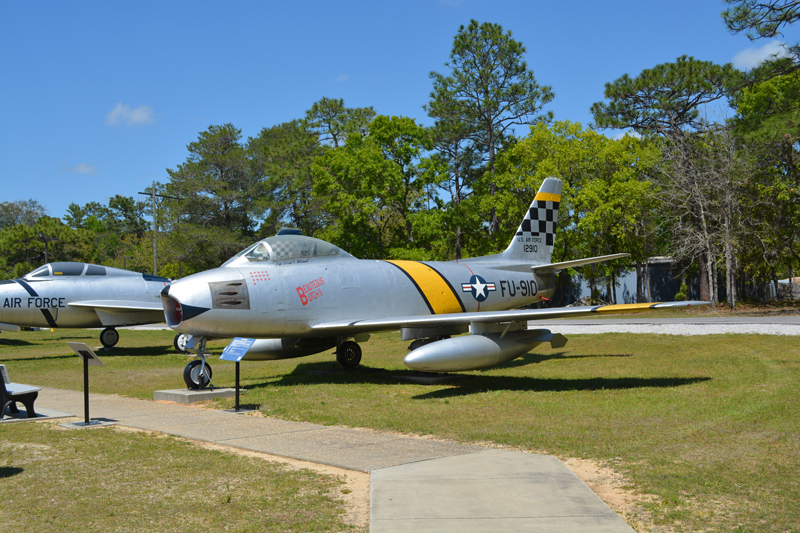 This F-86F aircraft S/N 52-5513, was donated to the AF Armament Museum by Gen Choo Young Bock from the Republic of Korea Air Force. This jet depicts the F-86F Sabre S/N 51-2910 flown by Captain Joseph McConnell who achieved triple-ace status (16) MIG-15 kills while stationed with the 39th Fighter Interceptor Squadron in Korea during the Korean Conflict. The 39th Fighter Interceptor Squadron was later designated as the 39th Flight Test Squadron on Eglin AFB that is now part of the 40th Test Squadron. This display is a tribute to the F-86 SABRE and to Captain McConnell the leading ace of the Korean War and to all of the men and women that served during the Korean conflict.